Sometimes one cannot have his household products all fiber-related, and there are always some copper cables or jackets remained by generations. In such cases, people have to buy at least 2 patch panels of different kinds. In order to satisfy various needs in cable management, the multimedia modular patch panel comes into being. How this little device helps and works? What Is Multimedia Modular Patch Panel? First and foremost, we have to figure out what a modular patch panel is. The fist glance at it we may find 6 ports on it. They are used to accommodate adapters and jacks, suited for Cat6a/6/5e/5 Ethernet cables and LC/SC/MTP fiber patch cables. The FS.COM modular patch panels accept all modules in copper and fiber which snap in and out for easy moves, adds, and changes, offering exceptional versatility and robustness to your system. Why Should We Use Multimedia Modular Patch Panels? Because they let you support legacy, current and emerging applications; they provide an easy upgrade path without requiring excessive recabling or changes in hardware; you can wire a single outlet for different applications; and you can often use standard and proprietary inserts, if necessary. The first patch of purchasers have posted feedbacks that it is worthy of trying. It is easily fit to your existed FHD 1RU rack mount enclosure and 1U metal cable management panel. 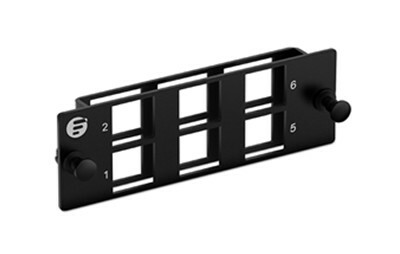 When we get a multimedia modular patch panel like the type shown above, we need to prepare at least 6 specially designed plastic clips (FS.COM provides them freely) to hold various fiber optic adapter on the panel. Insert the fiber optic adapter into the clip, then snap the clip on the adapter panel. A fiber optic interface is easily installed. The attached plastic clips offered by FS.COM fit a variety of fiber optic adapters, such as LC OM3 adapter, MTP/MPO adapter and LC OS2 adapter. In addition, copper unshielded keystone modules can be directly installed onto the panel. When the modular patch panel is completely loaded, we can apply it to a 1U fiber enclosure. And plug the copper and fiber cable into copper and fiber adapter respectively. To provide you with a more authentic experience, we have produced a short video for your reference. It is really a cost-effective invention that it not only saves the cabinet space, but also spares you the additional expense for another kind of patch panel. With flexible and modular design, multimedia modular panel enables optimum use of rack space. It can be installed quickly into the front of FS.COM FHD rack/wall mount fiber enclosure. Together with our horizontal cable manager, it makes your rack neat and fresh when deploying fiber and copper aggregated link. Whether you are looking for a modular panel with reasonable price or a device enabling better cable management, FS.COM 6 port blank multimedia panel is a good choice. Previous Previous post: How to Connect Patch Panel to Switch?